Mrs. O’Leary’s Cow may have gotten a bad rap but the folktale reminds us fire safety is an important part of farm life. People, animals, and property are in danger when fire breaks out on the farm. Inspect your barn and outbuildings for fire hazards to reduce the risk of tragic loss. · Heat lamps and space heaters are kept a safe distance from anything that can burn. · Heaters are on a sturdy surface and cannot fall over. · Electrical equipment is labeled for agricultural or commercial use. · All wiring is free from damage. · Extension cords are not used in the barn. · Light bulbs have covers to protect them from dust, moisture, and breakage. · Damage is identified quickly and repairs are completed with safety in mind. · Dust and cobwebs around electrical outlets and lights are removed. · Oily rags are stored in a closed, metal container away from heat. · Feed, hay, straw, and flammable liquids are stored away from the main barn. · The barn is a smoke-free zone. · Exits are clearly marked and pathways are clear. 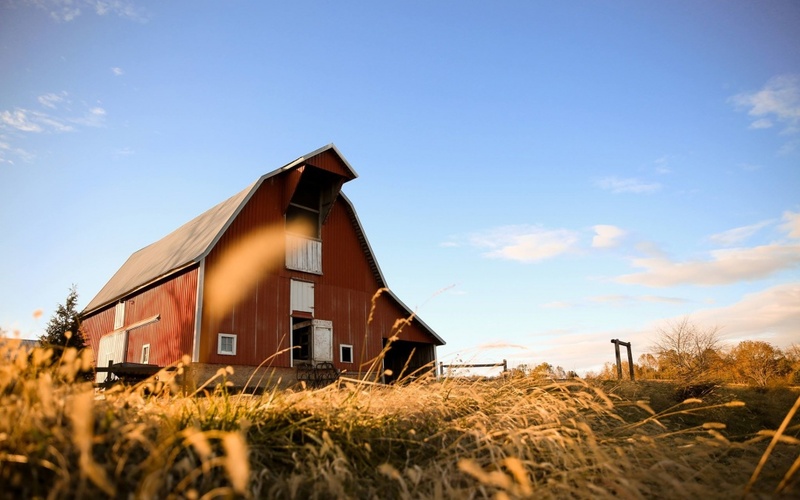 · Fire drills are held frequently with everyone who uses the barn. · Workers are trained to use fire extinguishers. · Everyone in the barn knows personal safety is the first priority if a fire breaks out. · Hazard checks take place on a set schedule. · Install and maintain ABC-type fire extinguishers near every exit and within 50 feet from any point in the barn. · Talk with your local fire department to address safety concerns unique to your farm. · Electrical work should be done by a qualified electrician. 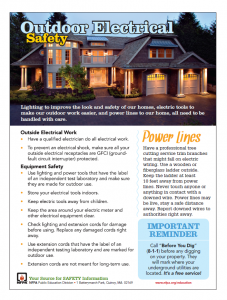 · Keep ladders at least 10 feet away from overhead power lines. Use wooden or fiberglass ladders outdoors. · Never touch a power line. You could be injured or electrocuted. Assume that all power lines are live. Stay at a safe distance. · Never touch anyone or anything in contact with a downed wire. You could be injured or electrocuted. · Report downed power lines to authorities. · Some power lines are underground. Call your local authority to have lines identified and marked before digging. You can also call the national 8-1-1 “Call before you dig” number.